The photovoltaic (PV) cells in traditional solar cells convert sunlight efficiently within a narrow range of wavelengths determined by the material used in the PV cells. This limits their efficiency, as long wavelengths of sunlight are not converted at all and the energy of short wavelength light is largely wasted. Scientists have sought to increase the efficiency of photovoltaics by creating "multi-junction" solar cells, made from several different semiconductor materials that absorb at varying wavelengths of light. The problem is, such multi-junction cells are expensive to make. Broadband solar absorption previously has been achieved using metal-insulator-metal (or MIM) resonators, which consist of an insulator sandwiched between a thick bottom and a thin top layer, each made of metals like chromium and gold. The metal components used in MIM resonators have relatively low melting points—temperatures that are reduced further when the materials are in very thin layers, as in the resonators, because of a phenomenon called melting point depression, in which the melting point of a material scales down as the dimensions of the material decrease. The metals in standard MIM resonators melt at around 500 degrees Celsius, hindering their usefulness in solar cells. Now a group of researchers in Denmark have discovered an alternative method to capture a broad spectrum of sunlight using a heat-resistant device made of tungsten and alumina layers that can be fabricated using inexpensive and widely available film-deposition techniques. The researchers describe their work and the new material in a paper published this week in the journal Optical Materials Express, from The Optical Society (OSA). "They are resistant to heat, including thermal shock, and exhibit stable physical and chemical properties at high temperatures," explained Manohar Chirumamilla of Aalborg University in Denmark, the first author of the new paper. This allows the absorbers to maintain their structural properties at very high temperatures. In experiments, the new absorbers were shown to operate at a temperature of 800 degrees Celsius and to absorb light of wavelengths ranging from 300 to 1750 nanometers, that is, from ultraviolet (UV) to near-infrared wavelengths. "MIM resonators absorbing in the spectral region from UV to near-infrared can be directly employed in different applications, such as solar TPV [thermophotovoltaic] /TPV systems and solar thermal systems," Chirumamilla said. "Other potential applications include in so-called tower power plants, where concentrated solar light generates steam to drive a generator." "This is the first step in utilizing the energy of the sun in a more efficient way than with current solar cells," he added. 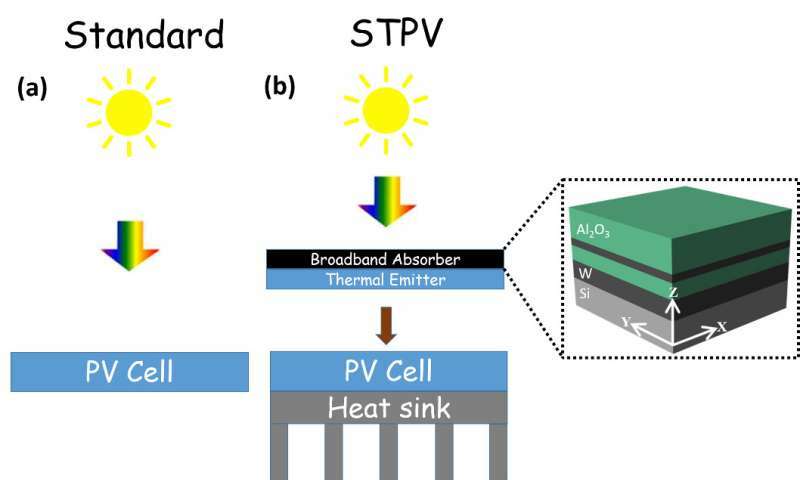 "Using an emitter in contact with our absorber, the generated heat can then be used to illuminate a solar cell—which can then function more efficiently when it is placed directly in the sun." If the absorber/emitter was behind a thin film cell couldn't this improve domestic as well as industrial concentrated cell designs?